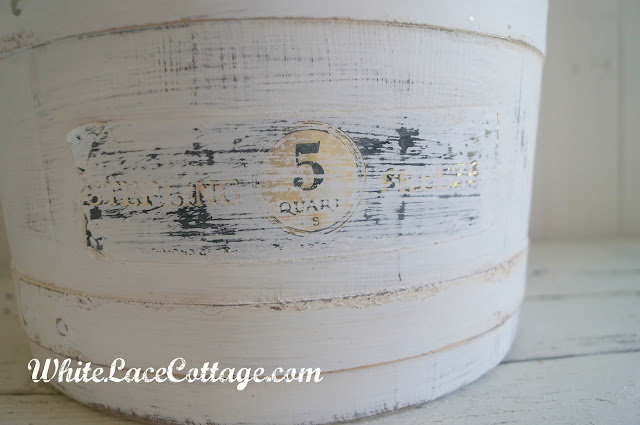 I have been searching for an old wood ice cream machine ever since I spotted one on Becky’s blog Buckets of Burlap .I also spotted one on Rusty Hinge .I love that old Handy freeze ice cream bucket.I have found a few.But I was not willing to shell out lots of money for one.So what’s a vintage loving girl like me to do?? ?Well find an old one and make it special yourself!!! Here it is.This started out looking like this. Not my style.But the price was right! I would love to have an authentic chippy old one.But this will do.It is old.But I needed to make it more my style. 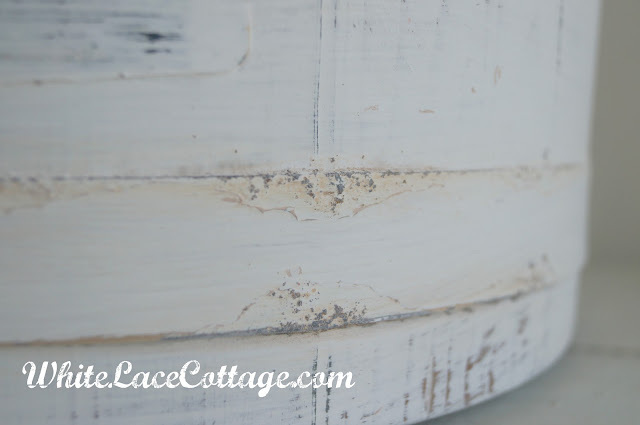 I had some left over paint from another project.I did not create any chalk paint.It is just regular old flat latex paint.After painting it I sanded it down.This was already rusty so the paint brought it out even more! Hydrangea’s fresh from my garden.The only thing blooming right now. This sanded down nicely.Love the worn look.Almost looks authentic. I love this look in my kitchen. And it was super easy to do! I love these hydrangea’s in my French pitcher too. I also added some to my blue mason jars! Looking forward to our concert tomorrow.We are taking my daughter to see Coldplay.Can’t wait!!!! Oh, that is beautiful! You just gave me an idea of what to do with one I have like that. Great job! Love it Anne! I’m going to spend more time, catching up with all my favorite blogs! You’ve got some lovely things going on that I’ve missed! How is your vintage space doing these days? That is one great transformation. I bought a turquoise one a few months ago, but I think I like it in white better. Might have to get out the paint now. I love it and now will be on the hunt for one to transform thanks to your inspiration! It turned out great and you will be able to switch it out easily for seasonal displays as well. Just charming! And I love seeing your hydrangeas! Mine haven’t bloomed since I got them and I think it might be my climate. They are so lovely! It does fit your decor much better. Very pretty, Anne. That’s beautiful!! The hydrangeas are simply gorgeous!!! That turned out fantastic!! Great job! Oh my goodness what a beautiful transformation. I love it and so pretty with the flowers. Just gorgeous! 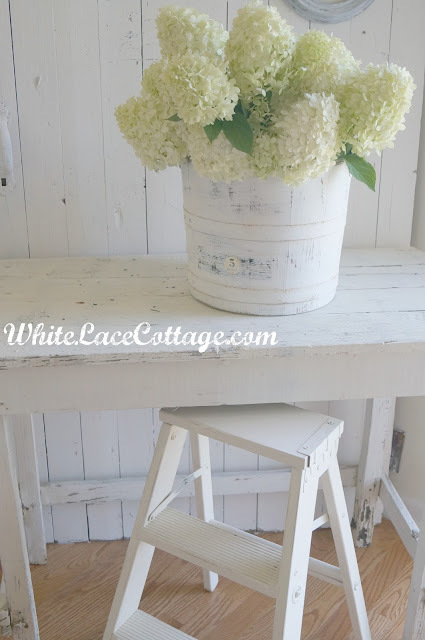 Such a beautiful transformation…love the hydrangeas too!Stopping by from Wow Us Wednesday. Anne, You did a great job on your ice cream bucket. Your hydrangeas look beautiful in it. Anne, I really like this! You did a great job. It’s so pretty. Now this is too cute!! I love this!! I want one!! 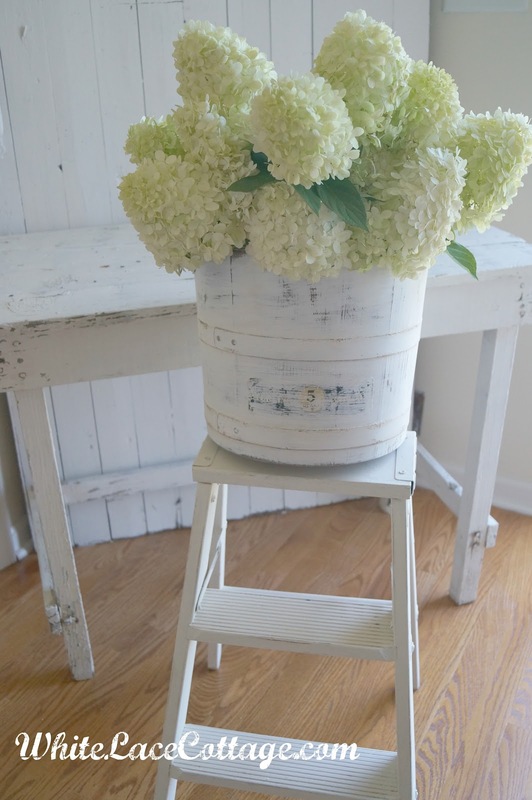 🙂 Your hydrangeas are just beautiful…love them in those pretty blue mason jars!! Creative and a green thumb!!! Hugs!! *Hope y’all have lots of fun at the concert!! 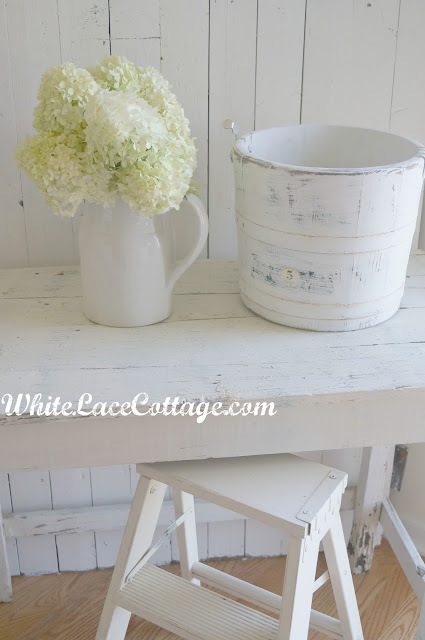 Love what you did to the ice cream bucket! 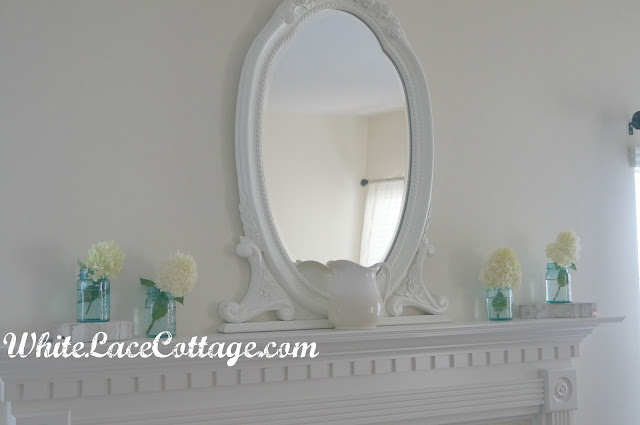 I love the white on white color combo you have, it’s so simple and fresh. The blue mason jars look perfect for a splash of color. Perfect! It looks like it was truly originally white. What a neat find, and tranformation. My hubby often reminisces about old ice cream makers and wishes he had one. Yours is really ‘cool’! This white vignette is so crisp and fresh! Your bucket came out really cute. Hello, Anne. Thank you for visiting my blog. You have a beautiful blog. Your pics are fantastic. You did a great job with the ice cream bucket….way to go. Anne, this looks great. So much better painted. I love the white you used. Anne, it looks wonderful. I love it! Now I want one! I think it’s fabulous! I really like the way you let part of the graphics show through and the rust too. Gorgeous! Love it in white! 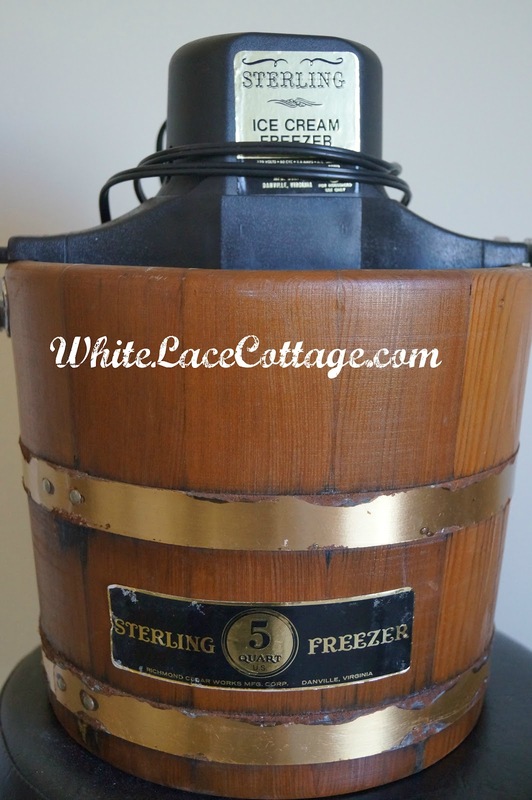 I’ve got 2 old ice cream makers, one blue and one green, and you’re right, they are pricey! Fabulous makeover! 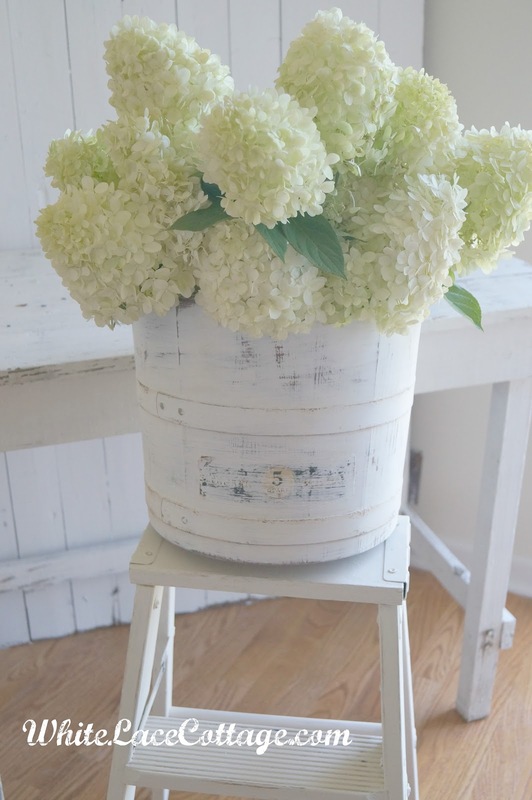 Awesome….love the white and oh, my gosh those hydrangeas…to die for!! Can’t seem to grow them here…darn….I remember seeing them in Seattle when I grew up..I loved them, even then. you did an amazing job! It’s gorgeous, the white paint is perfect and I love the 5! 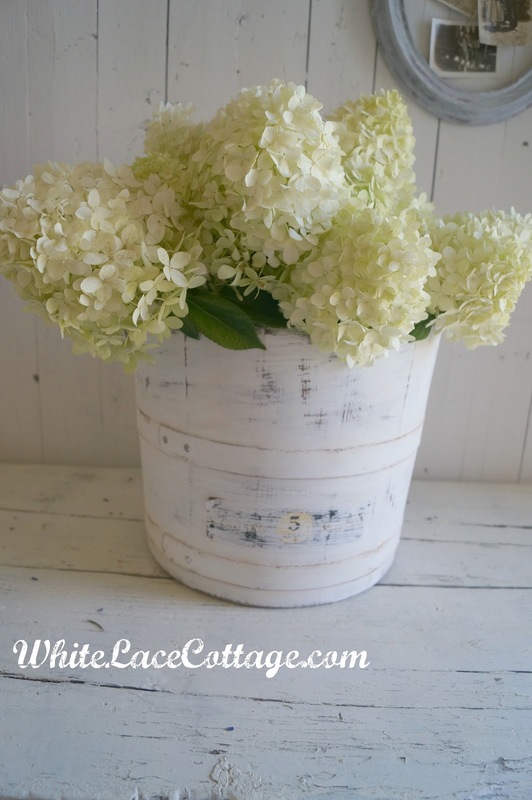 It looks fabulous in your kitchen with the hydrangeas, my favorite flowers! One of these is on my wish list! There are a few in the shop but not at the right price for me! love it! i love how the label shows through just perfectly! great makeover! This is so beautiful and creative. 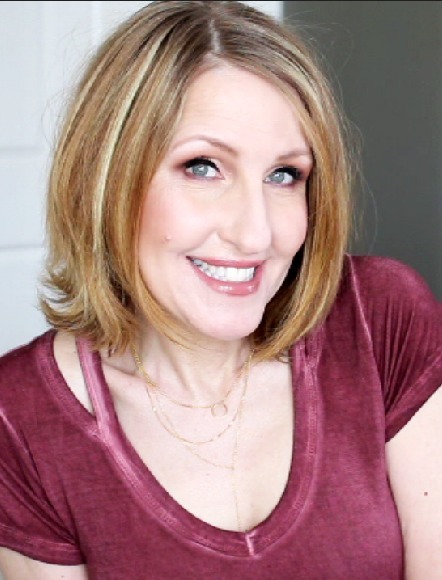 I have a link party on Wednesdays, and I would love it if you would link this post. It is called Wednesdays Adorned From Above Link Party. Okay….I would have totally seen this at a yard sale and walked by! Thanks for inspiring me today! Love it…now I know what do do with the one I have! Thanks for sharing at Share It One More Time!!! oh, it turned out lovely, anne:) i love how the label looks painted, too! have fun at the concert! That was a great idea to paint one that doesn’t have the color you wanted. It looks authentically old that way too! It makes a pretty container for fresh flowers. I bet that concert was GREAT! Well, goofy me, I just gave one of those away, and I could have painted it. Duh!! Yours looks lovely and great eye to see the potential. I love seeing what paint can do to transform something ordinary to something we love to put in our homes. The green and white just look perfect. I think this turned out beautifully! So pretty, and a great idea! Beautiful!! 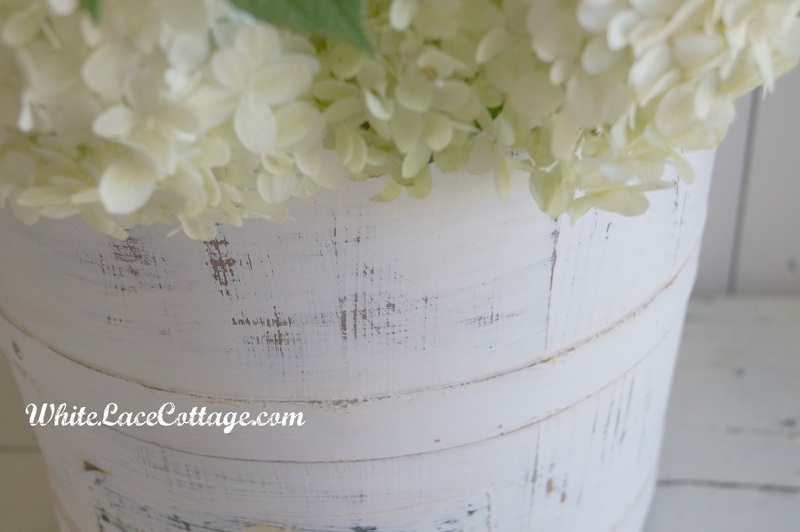 Love all the vintage white in your kitchen and the hydrangeas just give it an extra softness. Love it! hope you stop by if you have a moment.